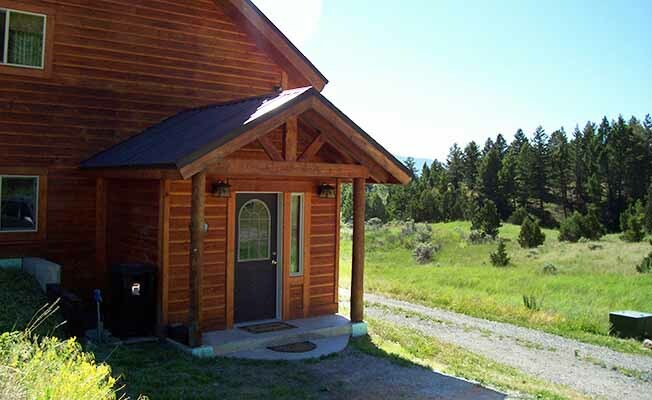 Yellowstone Mountain Home....quiet, calm, secluded, mountain views, crystal clean air, comforts of home on the edge of wilderness...25 minutes from Yellowstone National Park. This home is newly built (2011) to emulate that mountain-open feel with spacious sitting areas: family area for games and satellite TV and Wi-Fi throughout, living area in front of a wood stove, large dining table in bay area where you can see mother nature unfold throughout the day. Making those family meals, or morning cup of coffee is easy in this fully equipped kitchen new appliances: refrigerator, gas stove/oven, dishwasher, microwave, toaster, coffee maker/& grinder, pots & pans, and dishes. There are 3 private bedrooms and a loft area. On the main floor is a bedroom with a bunk bed with full/futon (converts to sofa) on bottom and twin bunk bed on top; and another twin bed. Upstairs is the Master Bedroom with a queen bed and private bathroom with body showers and 180 degree mountain views. Next there is another bedroom with a queen bed and in the loft area is a pull out full/futon sofa bed. Outside is a very large and secluded open mountain meadow area with firepit, small pond and hillsides filled with pine trees and aspens. Outside the kitchen door is a small area with a propane gas grill...to add that outdoor taste to your meal. The home is on a private road with easy access to Hwy. 89 to Yellowstone National Park. It takes about 25 minutes from the home to reach the North Entrance to Yellowstone. After a day at Yellowstone you can relax knowing all the comforts of home are here at the Yellowstone Mountain Home.